Is Everglades restoration good for fish? Florida’s economy depends on healthy fish, but little is known about how Everglades restoration efforts affect some of the state’s most lucrative sport fish. 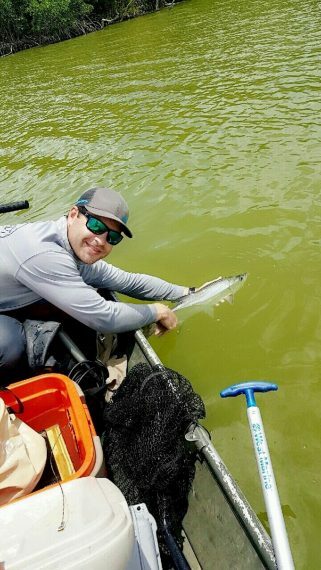 FIU student Cody Eggenberger is examining the impact on snook and tarpon in Florida Bay. Nestled between the Everglades and the Florida Keys, Florida Bay experienced major changes since the Everglades were drained for agriculture and development, including reduced water flow, high salinity and water contamination. Eggenberger, a master’s student in the Department of Earth and Environment, is trying to find out how predators and oxygen levels in the water influence where the sport fish go and where they live. Recreational fishing is an important social and economic activity in Florida. The industry is worth $7.6 billion and supports nearly 109,300 jobs, according to the National Marine Fish Service. To follow the fish, Eggenberger implanted tags in nearly 60 snook and tarpon. He did this alongside Jennifer Rehage, researcher in the Florida Coastal Everglades Long Term Ecological Research (FCE LTER) Program. He is relying on the nearly 50 acoustic receivers placed by the Ocean Tracking Network and the FCE LTER Program throughout Florida Bay to know when and where fish are using habitats. He is also using oxygen loggers to measure levels in the water, net hauls to count the number and location of prey, and longline fishing to count the number and location of predators. The information could pave the way for better resource management and restoration practices in the Everglades. Housed at FIU and funded by the National Science Foundation, the FCE LTER Program is dedicated to understanding how hydrology, climate change and people impact the Florida Everglades. Eggenberger’s research is also funded by the South Florida Water Management District and the Everglades Foundation’s FIU ForEverglades Scholarship.